For a while now, we’ve enjoyed the various liquid stevias on the market. I particularly enjoy using the lemon flavored ones to make sugarless lemonade or to mix with water kefir, since I let my water kefir go until it is tart. When I ran out of my last bottle, I went online to look for ideas on how to make my own. The ingredient list for a popular liquid stevia is water, alcohol and glycerin. I figured that making my own should be easy, as it appears that the liquid products are tinctures. I decided to tincture cut and sifted stevia leaves in vodka with dried citrus peels added to the mix. I obtained both the orange peel and stevia from Frontier. In two weeks, I’ll add glycerin to the tincture. 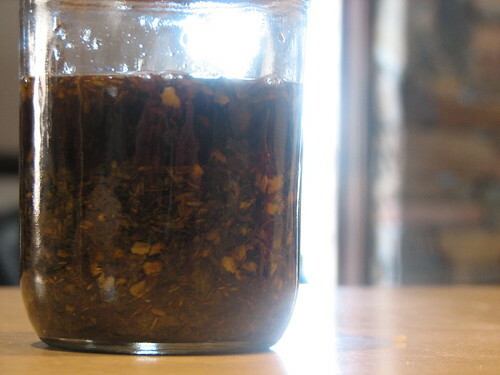 Once the tincture is finished, I’ll dilute it with water if it is too sweet. Since the vodka I used contains water (100 proof is 50% alcohol and 50% water), I didn’t think it necessary to add extra while it’s tincturing. We’ll see what we get and how it turns out. Since you normally use 2 drops per ounce of water, the final outcome will contribute only a tiny amount of alcohol to the drink, less than what you get if you drink something with vanilla extract or orange juice. Wondering how this worked! Please do tell! I posted a follow-up. I didn’t use enough orange peel, so I put it back in to steep with more orange peel. It should be ready in another week or so. I need to go check the date on the lid. But I was happy with the sweetness. I also keep getting hijacked by mob.conduit.com to something that looks like blog snippets.